“The purpose, even existence, of our Union is being questioned” – this is the opening line from the June 2016 EU Global Strategy and, above all, it’s over this widely spread awareness that the whole Future of Europe process initiated its reflection. Defence and security had its momentum with the launch of PESCO in December 2017, and it’s now revamping in relevant political statements, and not only in rhetoric. In fact, Jim Mattis – US Secretary of defence – pressed the European allies, on February 14th, to stick to the increase of the military budgets in the NATO framework. The past 12 months have seen more activity in EU defence than has ever been witnessed over the last 12 years. The High Representative, Federica Mogherini, boosted the action on EU defence, aiming at making the EU able to meet the triple task of dealing with international crises, of helping partners and of protecting Europe. One could therefore ask what the US concern is due to. The reason lies in the excitement that has energised politicians in Brussels for the milestone achieved with the launch of the European Defence Fund (EDF) and the Coordinated Annual Review on Defence (CARD). And in its antithetical historical premise: the collapse of the project for a European Defence Community. 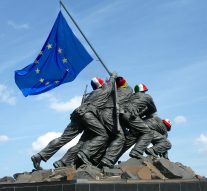 It was 1954, and Italy called for an all–in: it was necessary to choose whether the European States should have pooled their defence capabilities and established a democratic control over it, or if the European Community should have been founded on different basis. The latter solution succeeded. Why does this matter, now? While the world becomes less and less stable, with the international relations being more and more based on multipolarism, and the US losing their political influence, Europeans started to firmly believe that the EU can brace itself or can act, together. Acting together was the 63 years–late answer. Yet something must have gone wrong when the EU delivered to the US the message of its increased commitment to the world stability. The EU never really questioned its belonging to North–Atlantic Alliance: kick–starting a European common defence plan doesn’t imply to have it out of the NATO. If anything, it means more autonomy of the EU to pursue its foreign politics goals, and weigh its leverage in the NATO, instead of following the US international politics only. The paradox of the US political leadership lies here: while it bullies, in Juncker’s words, EU Member States on NATO spending, it also calls for less interventionism and no responsibility on the US’ shoulders for the global disorder. The renewed European will to democratically take its responsibilities and role in the world balance of power is the natural consequence of the current situation. The paramount function of every State is to protect its citizens. The Future of Europe process has its foundations in the assumption that European citizenship is not a reality yet, or at least that it isn’t tangible for the European people. This awareness walks hand in hand with the reflection on the missing dimension of the European sovereignty, that instead could make Member States stronger together. The defence and the External Action have always been the main example to explain the fragile balance that animates the fakir–like EU institutional framework. Therefore, the EU Commission decision and effort to link its citizenship and its external dimension, and to use the latter to revamp the first, can only be welcomed. Also because this will make the EU more relevant both internally and externally. The American frustration has been comforted many times by all the EU officials and representatives: the EU project doesn’t aim at undermining NATO but at making it more aligned with the world state of affairs. In a multipolar world, the US have to start accepting a plural leadership in NATO. Having the cake and eating it was never a good premise in history for the peaceful developments of any crisis. The EU is baking a new cake, and the US can only help with the recipe. Otherwise we will all have to eat a burned one. « Previous Article PRIMA – New Calls for Proposals Published Out!